Light refreshments and a cash bar will be available. Great Door prizes to be won! Born and raised in Belleville, Ontario, Matthew graduated from McMaster University with his Bachelor of Health Sciences in 2012. More recently, he completed his Master of Business Administration from the Rotman School of Management at the University of Toronto. Matthew started in the sports industry at the National Hockey League head office where he supported business development for both the 2016 World Cup of Hockey and the 2017 NHL Centennial Season. 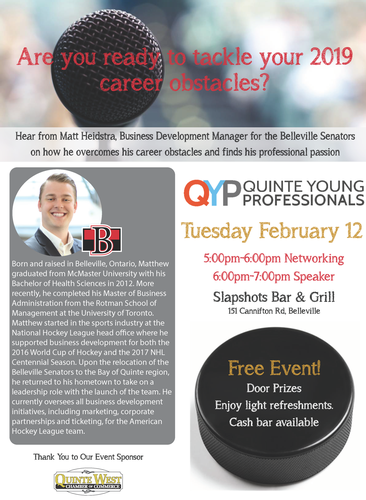 Upon the relocation of the Belleville Senators to the Bay of Quinte region, he returned to his hometown to take on a leadership role with the launch of the team. He currently oversees all business development initiatives, including marketing, corporate partnerships and ticketing, for the American Hockey League team.